Be the first to share your favorite memory, photo or story of Antranik. This memorial page is dedicated for family, friends and future generations to celebrate the life of their loved one. 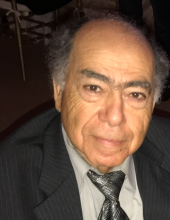 Antranig Karadolian, 74, of Farmington Hills passed away on Tuesday, April 2, 2019. Antranig will be remembered as a hayrenaser, kind-hearted person, green-thumbed gardner, but most of all as a devoted husband and father, continuously exuding unconditional love for his family. He is survived by his wife of 44 years, Vartoug, and their children Sevan (Joseph), Hagop, & Viken (Mariem) and grand-children Nasayah, Alec, Sophie, & Alexander. Antranig was born in Aleppo, Syria, and later moved with his family to Anjar where he called his home. He was an exemplary eldest brother and role model to his siblings Sarkis, Hamed, Setrag, Parounag, Berjouhi, & Krikor. Antranig attained a high school education, studied in a seminary in Antilias, & attended trade school in Milan. In January 1974, he married his love, Vartoug and were happy to start their family together. He moved his family to the U.S in 1985 to begin a new life with hopes of a bright future. Visitation will be on Friday, April 5 from 5-8PM at St. Sarkis Armenian Church. Funeral service will be held on Saturday, April 6 at 10AM, with prayer service at 11AM at St. Sarkis Armenian Church. In lieu of flowers memorial donations can be made to the Mousaler Association of Detroit. To send flowers or a remembrance gift to the family of Antranik Karadolian, please visit our Tribute Store. "Email Address" would like to share the life celebration of Antranik Karadolian. Click on the "link" to go to share a favorite memory or leave a condolence message for the family.